First all of let’s get the very basic fact right. Malayali (also spelled Malayalee) is the term used to refer to the native speakers of Malayalam, originating from the Indian state of Kerala. It is another modern equivalent of the term Keralite. From what I have read and understood, Malayalam has its origin from the words mala meaning mountain and alam meaning land/locality which lies alongside the mountain. Hence, Malayalam is the language that spoken by the Malayalis (i.e., people from the mountains) who lived beyond the Western Ghats. Unfortunately, about 80% of non-south Indians think that all south Indians are from Tamil Nadu. To most of the non-south Indians, all south Indians are Madrasi. According to them, all south Indians speak Madrasi as well. Now, I don’t feel offended at being called a south Indian—after all, I am one. But, I am put off by the usual assumption that south Indians are from Tamil Nadu or from Madras. It is as silly as saying that all North Indians are from Punjab. Person: So, are you a Maharashtrian? Me: No. I am a Keralite. Person: Ahh, you are a Madrasi. Person: The same thing… you are mallu. Me: Aahhh… well I am a Malayali. By then, I realize that there is no point stretching the conversation. According to the person’s GK south-India = Madrasi/Mallu. The fact is that Malayalis are not Madrasis. Not all Tamilians are Madrasis either. Madrasis are Tamilians from Madras. We also need to acknowledge the fact that now, there is no Madras—its Chennai. Since Madras ceases to exist, the word Madrasi is no longer relevant! The fact is, South India consists of 5 states—Kerala, Tamil Nadu, Andhra Pradesh, Telangana, and Karnataka. Each state has its own language, culture, traditions, and rituals. Similarly, most of the South Indians also have a misconception that all the people outside of South India are North Indians—including Maharashtrians, Gujarathis, Bengalis, etc. Here is a map showing the North Indian state. 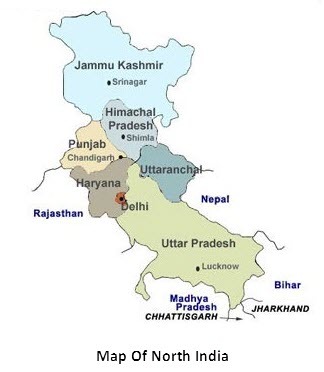 There are 6 North Indian States (Haryana, Jammu and Kashmir, Himachal Pradesh, Uttar Pradesh, Punjab, Uttarakhand) and one Union Territory namely (Delhi). So now that the region-specific problem is dealt with, let’s move on to the next problem. As far as I have understood, mallu is a slang that refers to a person who is born in Kerala and speaks Malayalam. So, it is a short form for Malayalee. Many of my friends use the word mallu as an acronym for malayalee not as a derogatory term. I don’t know about the others, but the Mallu thing annoys me no end. The next area of concern is the language. We all know, or rather I know that Malayalis speak Malayalam. But a large percentage of the Indians feel that the Malayalis speak Malayali. Many people have asked me, “So you speak Malayali?” Earlier, I used to just nod yes. Now-a-days, I take time and the pleasure to explain that Malayalis do not speak Malayali—it is not a language. We speak Malayalam. To go to Thuubai, zimbly to meet his ungle in the Gelff. Why do Malayali’s go to the Gelff? Why did the Malayali go to the concert in Rome? Because he wanted to hear pope music. What does a Malayali use to commute to office(oaffice) everyday? YAMM – YAY – YELL – YAY – WHY – YAY – YELL -YUMM. Is it their mistake that they pronounce in a specific manner? Is it not so because they are taught these things at school? I remember my daughter been taught phonetics at school (from class 1 and 4). She was then taught the right and wrong pronunciation of words. Later, in class 9 and 10, their English teacher used to make them read their lessons aloud and correct their pronunciation. As a student, I used to pronounce kangaroo as kan-ga-roo, because I was taught so by my teachers. Hear the correct pronunciation here. Hence, teaching the correct pronunciation is a good initiative at the school level. Students from all backgrounds speaking diffrent accents associated with their language (mother tongue) will be corrected and taught the correct pronunciation. But for this, we need good, knowledgeable, and dedicated teachers at school. This is not an original article. It has been doing rounds in the Internet for a while now. I have used it here because this is a classic example as to why precision in language is inportant. precision involves using words accurately and consistently, defining terms, and ensuring the agreement between various sentence elements. Laddies and Gentlemens, Contemporaries, and Childrens, This is my first maiden speech. If small small, little little mistakes get inside my speech, I ask pardon. Stickly speaking, I wanted to joint your school more fastly, but can’t do it for the following reason. Too much time lost in getting slipper reservation in three-tyre compartment. The clerk rejected to give ticket to me. I put complaint on station master. He said me to go to lady clerk. At first she also rejected me. I then pressed her for long time and at last with great diffculty she gave a birth only to my son. Anyway I thanked the station master because he was responsible for getting birth of my son. We got independent because of great leaders like Gandhiji who get-outted all angrezi peoples from India. Tilak said Swaraj is our birth-rate and we shall halve it. Today we all halve our birth-rate. You children are future dynamic generators of the Nation. Look into future time only. No backside looking or looking at your behind. Be like great Presidents Loosebelt. You know genius, no? It is one per cent perspiration and ninety seven percent evaporation. They became great by reading great books. Well, it is another thing that the entire article is a BIG mistake.